Founded in 1992, this annual offering of juried, educational scholarships are SNAG’s most highly competitive scholarship awards. We are now taking applications for the 2016 scholarships. Deadline is March 17, 2016. SNAG awards three student scholarships with at least one award given to a student that is currently an undergraduate. SNAG also awards three juried scholarships for emerging and mid-career artists to use toward a workshop of their choice in North America. Cindy Edelstein, entrepreneur, author, editor and long time consultant to the jewelry industry, died suddenly January 24, 2016. She was 51. The cause was heart failure. 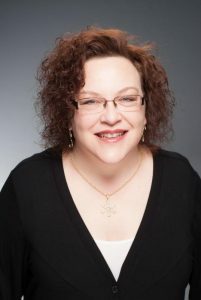 Cindy was to present at the upcoming SNAGneXt conference, and we are deeply saddened that she will not be with us. Cindy began her career in the jewelry industry as an editor at JCK magazine where she was the fashion editor. This brought her in contact with jewelry designers and their work, and she soon came to realize that working with them would be her life’s work. In 1991, wanting to support the growth of this segment of the industry, she founded the Jeweler’s Resource Bureau with her husband, Frank Stankus, with the idea of highlighting the designers and their work in multiple ways. Over the years she worked in many roles to that end, including that of trade show consultant for the JCK show, the Couture show and the AGTA show as well creating her own designer-centric show, globalDESIGN. She also was a prolific writer about jewelry design and her byline could be found in every jewelry trade publication as well as in industry online columns. With her husband, she co-wrote a book titled Brilliance: Masterpieces from the American Jewelry Design Council. It sold out of its first printing. Her efforts to help designers of every level of achievement brought her some well-deserved recognition. She was awarded the prestigious Benne Award by the American Jewelry Design Council in 1995, and was the 1996 winner of the Contemporary Design Group’s award as Best Designer Advocate. She was a long-serving member of the board of the Women’s Jewelry Association, an international group to which she devoted many years of volunteer work. In 1990, she received that organization’s Award for Editorial Excellence, and in 2001 she was recognized again by the same group for her Excellence in Marketing. Cindy was born in Brooklyn and attended schools on Staten Island. She attended college at the Fashion Institute of Technology and Hofstra University from which she graduated with a bachelors degree. She is survived by her husband Frank, a daughter, Remy Sasha Stankus, a stepson, Byron David Stankus, a brother, Philip Edelstein, as well numerous cousins, nieces, nephews and other family members whom she loved so dearly. Services are being arranged and will be announced as soon as possible. 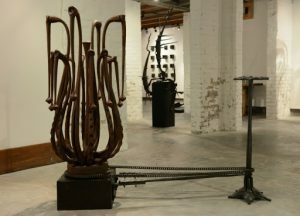 Rachel David had new sculpture at Barrister’s Gallery in New Orleans in December 2015. David is a blacksmith artist making hand forged sculpture, architectural elements and furniture. Jeffrey Lloyd Dever was invited to participate in the biennial 2015 Beijing International Contemporary Metal & Jewellery Art Exhibition in Beijing, China this past fall. Anne Havel has work included in the following current or upcoming exhibitions: Nurture by Nature at Lapham Gallery of the Lower Adirondack Regional Arts Council, Glens Falls, NY. Materials: Hard & Soft, Greater Denton Arts Council/Patterson-Denton Arts Center, Denton, TX. Alchemy 3, Juried Exhibition of The Enamelist Society, League of New Hampshire Craftsmen and McGowan Fine Art , Concord, NH. 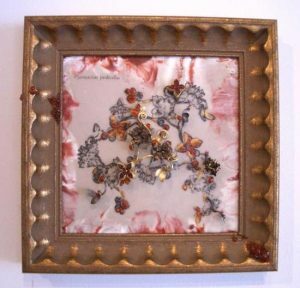 In addition, the Enamel Arts Foundation has acquired two of her pieces for their permanent collection. Laura Jaklitsch was selected as Contemporary Craft’s 2016 Lydon Emerging Artists Program (LEAP) winner. Jaklitsch, who received her BFA in Jewelry and Metalsmithing in 2011 from Massachusetts College of Art, elegantly combines traditional craftsmanship and modern design in her work. Bruce Metcalf’s work was included in American Craft Council’s Art In Wood exhibition and he was featured in MODERN magazine. Metcalf’s work has also been chosen to be part of Schmuck 2016. Jennifer Trask will have work featured at the Renwick Invitational 2016. She is one of four esteemed artists chosen to participate in the exhibition. 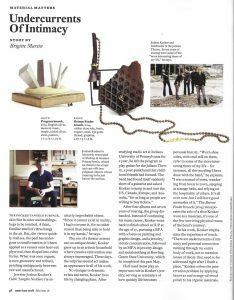 The February/March issue of American Craft magazine features an article by Brigitte Martin about Joshua Kosker. Congratulations to Martin for her first article published by American Craft. Be sure to check out the double-page spread of Kosker’s amazing work. Lynn Batchelder (at right) and Aric Verrastro were named as two of the five finalists for Art Jewelry Forum’s 2016 Artist Award. The finalists will exhibit their work with Sofia Björkman, from Platina, during the international art jewelry fair Schmuck, in Munich, Germany, February 24-March 1. A cash prize will be awarded to one of the finalists, to be announced in February. SNAG would like to take this opportunity to recognize our Corporate Members for their support: Aaron Faber Gallery, Halstead, and Pocosin Arts. We are so thrilled to celebrate our first ever SNAGneXt: An Interchange and Exchange on the Many Facets of Making a Living in the Field with YOU! SNAG is looking forward to leaning into the conversations surrounding entrepreneurship, how we can make a living in the field, and thrive in doing so. We have a great lineup of speakers that you won’t want to miss! Join us in Asheville, North Carolina from May 18th – 21st by registering today and escape into the mountains with us! SNAG is happy to announce our new Technical Education Program and Director. Victoria Lansford is joining the SNAG staff as the new Director of Technical Education. For over 25 years, post-conceptual artist, educator, and author Victoria Lansford has created one-of-a-kind wearable sculpture and art objects that evoke the mystery and splendor of ancient masters yet are infused with her own provocative vision. Focusing on old world metalsmithing techniques, including high relief Eastern repoussé, Russian filigree, chain making, and granulation, Victoria has paved the way for contemporary artists to utilize these ancient processes in new ways. Victoria’s work has been seen in exhibits at the Museum of Contemporary Craft, Houston Museum of Fine Arts, the Wayne Arts Center, the Mulvane Art Museum, the von Liebig Art Center, Houston Center for Contemporary Crafts, Rochester Institute of Technology, and the Georgia Museum and in numerous publications, including the Lark 500 book series, Metalsmith and Jewelry Artist magazines, Repousse and Chasing (Brynmorgen Press), On Body and Soul: Contemporary Amulets to Armor (Schiffer Publishing) and on Home and Garden Television. SNAG’s new technical education program will focus on archiving the wealth of information within our jewelry and metalsmithing community and making it available to future generations of makers. New technical articles will be a collaboration between established educators of all types and emerging and established makers in the field. The educators contribute projects and lesson plans from past curriculum that focus on particular techniques or design challenges. The contributed project will be matched with a maker, who follows the project and documents the processes and his/her experiences in an engaging digital format. 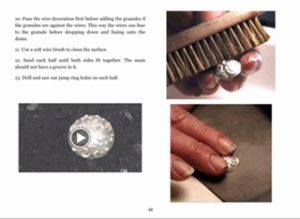 In addition, there will be a call for images of each project from the educator’s past students to show how multiple makers have approached the same concept and how this lesson had informed the student’s future work. Interested in participating? SNAG is offering a flat fee for articles! Please email Victoria Lansford and indicate whether you would like to contribute a project or lesson plan or would like to create an article based on one.